A Map from the Clearing. This painting was done the same week that I did Circle Dance/Six Witches which I’ve always felt is more successful as a painting. However, looking back, this one (which I’ve never formally shown) marked an important stage in our process together. I worried in Surfacing that Tom wouldn’t be willing or able to come with me on the journey to my deeper self and the wild worlds of psychic and mystical exploration. This painting showed me that he was actually almost more eager than I – he’s the naked one leaping towards the opening of the labyrinth, while I still kneel at the gate, needing to be urged forward despite my orange cloak of power. And indeed, he has been much more outspoken in some ways than I have over the years and bravely to a wider audience of his professional peers. Shortly after this he definitely began to incorporate spiritual mystery into his work. (See www.tombender.org ). 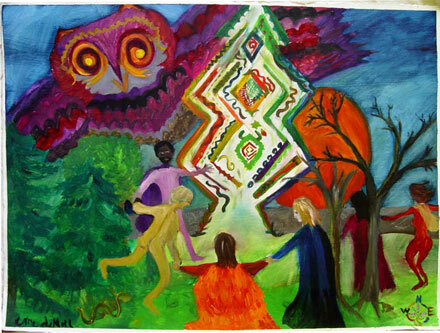 10/25/95: I painted myself in my orange cape kneeling or sitting and trees on either side of a sort of labyrinth – not a formal, traditional one, but one showing different paths to take in life, all ending in the same place – out at the top of the page. But I realized that part of the clearing for me is working with – opening up to other people. So I drew in three women’s figures holding hands and snaking in among the trees and off the paper as if there were more just out of eyesight. The closest one is reaching to urge me along. On the left I realized I wanted men. I do not want to just rely on women. I love the energy of men opening up as well. I really struggled with the shape and color of the guy holding my hand – by yesterday towards the end he became naked and became Tom. Am I afraid of committing him to my weird journey? I’m sure I want him along. In fact, recently I’ve had the sense that he’s waiting unconsciously to see what I decide to do with all this. We’ll see. I stopped there exhausted – and wishing I had chosen a smaller piece of paper because the thing could have been done. As it was there was a huge piece of empty sky on the left and a smaller section on the right. I have been reading more and more about the Goddess these days. Working slowly through The Chalice and the Blade by Riane Eisler and this week The Language of the Goddess – the Marija Gimbutas tome about symbols on artifacts – came through inter-library loan. So I had a sense that a symbol of the Goddess might come into focus for that area. I thought of a bird but could not choose among the various birds that have had power for me over the years – gull, hawk, raven. Suddenly the owl popped into my head. I’ve been in touch with how important Athena has been to me over the years – ever since I acted her in 5th grade in our Oldest Group play. 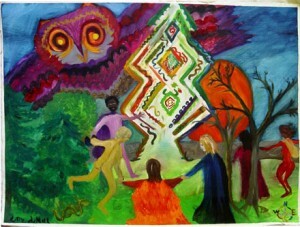 So there’s a wonderful purple owl with piercing yellow eyes swooping over the painting. I really had fun painting her.